How do you know when the time is "right" to upgrade your technology? After all, things change so rapidly that today's innovation is sometimes obsolete within a year (or less!). But here is one thing that I believe remains true: new technology can help you add value to your clients, your practice, and your life. Download our free Total Technology Solution guide to learn how our platform can add value to your clients and your practice. Here, I'd like to focus on your IT system—one of the most important things you can upgrade. 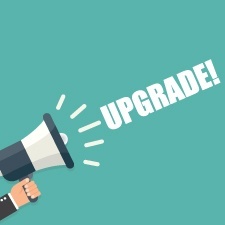 Let's start with a few benefits you'll see in your practice, plus some pricing options when it comes to making the upgrade affordable. What Are the Benefits of an Updated IT System? 1) Increase your productivity. Because they are equipped with multiple processors, better hard drives, and faster memory, today's systems have the power to do a lot, all at the same time. Plus, you will likely find newer machines to be faster and easier to use. Invest in a machine with an Intel i5 processor (latest generation). Multiple processors allow your computer to do many different tasks simultaneously, which improves speed and productivity. Opt for a 256-GB or larger solid-state drive (SSD). SSDs are at least 10 times faster than traditional mechanical hard drives. They also don't have any moving parts, which means they produce less heat and have a longer battery life. 2) Keep your systems compatible. Why would you use a VCR when you could use Netflix instead? It would put you at a disadvantage, as does using an older computer system. System requirements are always changing, and older computers simply don't deliver the benefits of new equipment. They also don't work seamlessly with the latest software. They can be a security risk, as older systems are generally not supported by the original manufacturer. They cannot run the latest software. They are slow, which will have a detrimental effect on your productivity. 3) Protect sensitive information. In today's world, cybersecurity must be top of mind for business owners. We're very much aware of this here at Commonwealth and offer affiliated advisors our own cybersecurity program, the Commonwealth Shield. But we also encourage them to use equipment that has the most secure operating systems, web browsers, and encryption applications. These features will help eliminate many potential threats and keep confidential information secure. Also, keep in mind that a computer's hard drive lasts about three to five years. Once it fails? It's gone for good—and retrieving files and data off a failed hard drive is not always possible. Plus, a new computer is often cheaper than a separate hard drive and backup system. Build the expense into next year's capital plan. Create a budget for this expense and come up with a plan for funding the cost. Another option is to make it a planned and recurring capital expense every three years. Spread out the cost. Instead of replacing all of your computers at once, add a new one every quarter. This will spread out the cost and help manage your cash flow. Do it all at once. If you have just a few computer systems, upgrading them all at once might work best. This way, you can minimize the disruption to your practice, and you might even be able to negotiate a lower price. Take advantage of the tax break. According to Section 179 of the U.S. Internal Revenue Code, most small businesses can deduct the full purchase price of qualified equipment in a single tax year. Of course, certain guidelines and limitations apply, so be sure to check with your tax professional before taking advantage of this deduction. Is a Technology Upgrade Right for You? There's nothing worse than the frustration caused by slow performance or system crashes when you've got a deadline looming. So, if you're having trouble opening documents, waiting ages for webpages to open, or worried about viruses and hackers, you may want to consider purchasing a new system. Plus, keep in mind what a newer system can say about your practice. It can show your employees that you're giving them the tools needed to do their jobs. And for your clients? An upgrade demonstrates that you have the financial means and long-term vision to invest in technology—and that you're doing all you can to give your clients an edge. Have you upgraded your technology recently? What were some of the benefits? Please share your thoughts below.